Back in 1979 I started a love affair that over the years would reveal to me the deepest sense of my own nature. 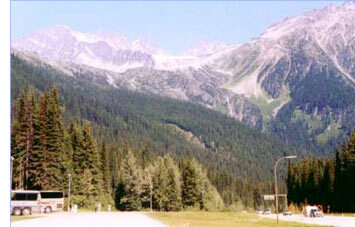 It began in late winter in the Canadian Rockies. I was coming out of another love affair and uncertain how I would cope without love in my life. Then one day in early spring while out walking I saw her through a window. She was the most beautiful thing I had ever seen; with her sleek shape and smooth lines, I knew I had to have her or I would never be complete. Skiing would always be my first love, but now I had found my first summer fling and my first touring bike. That spring for two and a half weeks, I crossed some of the highest peaks in the Canadian Rockies from Prince George to Revelstoke and beyond by bike. Whether skiing or biking, touring has always been a very Zen-like thing with me. 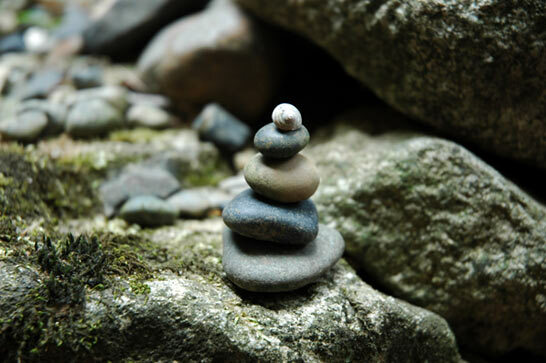 The motion has a calming and focusing effect. The idea of travelling somewhere at a steady rate under my own power builds confidence and reduces ego. The entire experience is humbling in the realization of my limitations. Most importantly it puts me in touch with nature, makes me reliant on it, makes me feel my own skin in relation with all of life. After thirty years I am still loving the experience. 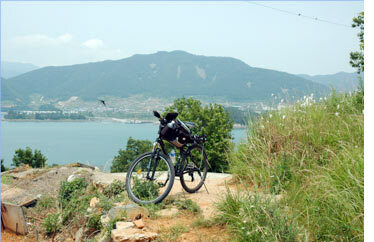 In Korea biking has been a mainstay since ski tours have not been much of a possibility yet. 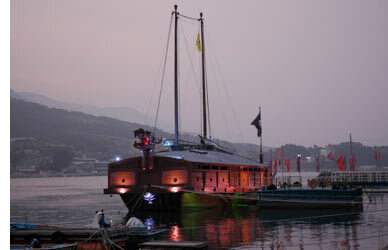 This spring for four days and three nights I toured the small island of Namhae on the south coast. It's actually two islands joined by a land bridge in the south. The landscape is idyllic and pastoral with terraced rice paddies, backed by lush green forests that swathe the rising peaks in the center of the island. 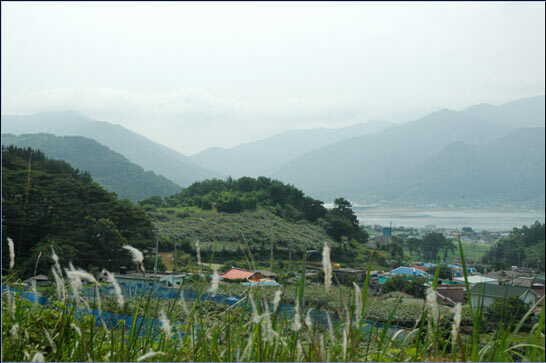 There is one main town of Namhae and many small villages dotting the main road that circles the island. 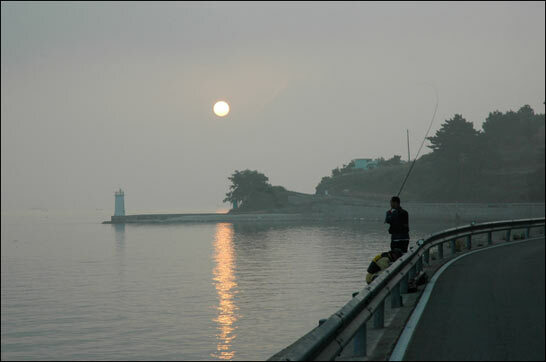 For the most part the island has a very rural and disconnected-from-the-mainland feel. 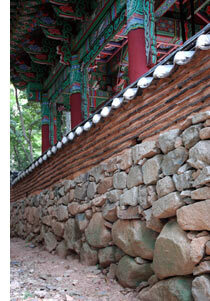 There are several major tourist developments in the south but these are completely deserted during weekdays. I usually don't plan a tour too much. It's part of the adventure and pleasure of discovery. Youngmunsa was one such discovery. 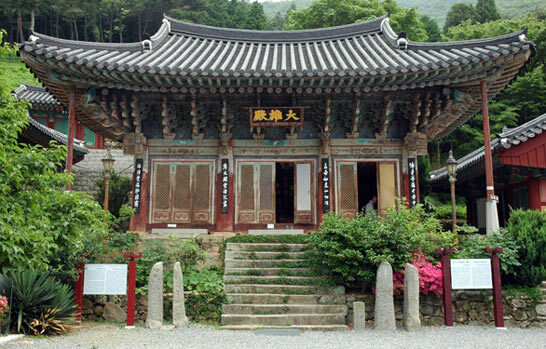 It is a Buddhist temple whose origins date back to the ninth century. I almost didn't go because it was a side trip that would take me a kilometer up a mountain in the late hot morning sun after riding for sometime with a ways to go until my next stop. I knew, however, that the ride back would be an exhilarating downhill zip, and maybe that's what clenched my decision. 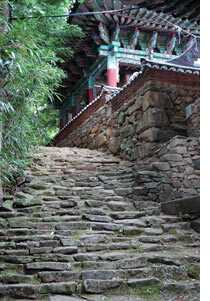 The final ascent was so steep I had to walk the bike up the last 100 meters to the temple gates.